From automated factories to the constantly revolutionized field of automatic cars, it seems more and more facets of our lives are being transformed to require minimal – if any – manual operation. Garage doors have been going at it for quite some time now, but there are some homeowners who remain unsure as to the benefits automation has to offer. Imagine this scenario – you return home after a long day at work, but instead of simply driving your car into your garage you have to do the following: pull up in front of your closed garage, leave your car, manually open your door, get back in your car, drive it inside your garage, get out of your car again, and – finally – close your garage door back up. No, wait. There's one more step – slumping to the floor with an exhausted sigh. All that wasted time, not to mention, all those wasted breathes, can be easily avoided. How? You can probably guess. Automation. 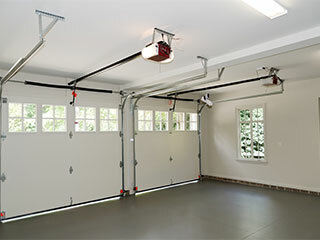 A garage door opener will boil all that hassle down to a simple push of a button. When you manually open and close your garage door, you are placing yourself in a compromised position. Let's put it this way, there's a reason controlled demolition is performed remotely. That way everybody stays clear of the blast zone. Well, if you operate your garage door and a spring snaps, or if the panels collapse, you are standing at the center of the potential danger zone. If your door is automated, however, you can order it to open or close from a safe distance. Unless you put a lock on your manually operated garage door, opening and closing it can be done by virtually anyone. If you do put a lock on it, you have to deal with it each time you enter or leave, not to mention, it can still be picked or removed with a bolt-cutter. Many garage door openers offer several security features that can prevent your door from being operated by anyone other than yourself and your family. To make sure your daily routine is as efficient as possible, and that your home is as safe and secure as it can be, contact our experts at Garage Door Repair Sherman Oaks today to get the perfect opener for your specific needs.